M. Nakauchida Kaneko Makoto Holdings Co., Ltd.
K. Hagiwara Danox Co., Ltd.
H. Toda Shadai Race Horse Co., Ltd.
N. Hori Sunday Racing Co., Ltd. The Satsuki Sho, which is the first of the three legs of JRA’s Triple Crown Classics for three-year-olds including the Tokyo Yushun (Japanese Derby, G1, 2,400m) and the Kikuka Sho (Japanese St. Leger, G1, 3,000m), is comparable to British Two Thousand Guineas. The “Yokohama Norinsho Shoten Yonsai Yobiuma”, the precursor of the Satsuki Sho, was first run over 1,850 meters at Yokohama Racecourse in 1939 then moved its venue to Tokyo Racecourse four years later before given its current name and shifted again to Nakayama Racecourse in 1949—the distance was also altered to 2,000 meters in the following year. Seven of the past Satsuki Sho champions since 2005 subsequently received the JRA Best Three-Year-Old Colt Award, in recognition of their outstanding performances throughout the year—Deep Impact (JPN, Sunday Silence) in 2005, Meisho Samson (JPN, by Opera House) in 2006, Victoire Pisa (JPN, by Neo Universe) in 2010, Orfevre (JPN, by Stay Gold) in 2011, Gold Ship (JPN, by Stay Gold) in 2012, Isla Bonita (JPN, by Fuji Kiseki) in 2014 and Duramente (JPN, by King Kamehameha) in 2015. 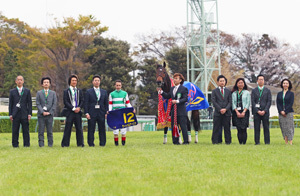 Triple Crown winners Deep Impact and Orfevre were also named the Horse of the Year. This year’s key runners that came off three trial races were: from the Yayoi Sho (G2, 2,000m; Mar.3), Meisho Tengen (1st), Schwarz Riese (2nd), Breaking Dawn (3rd), two-time graded winner Nishino Daisy and Keisei Hai (G3, 2,000m) victor Last Draft who finished fourth and seventh, respectively; from the Wakaba Stakes (Listed, 2,000m; Mar.16), Velox (1st); and from the Spring Stakes (G2, 1,800m; Mar.17), 2018 Keio Hai Nisai Stakes (G2, 1,400m) victor Fantasist (2nd) and 2018 Asahi Hai Futurity Stakes (G1, 1,600m) runner-up Kurino Gaudi (6th). The field also included Danon Kingly, 2018 Asahi Hai Futurity Stakes winner and Best Two-Year-Old Colt Admire Mars and 2018 Kyoto Nisai Stakes (G3, 2,000m) winner Courageux Guerrier who came off a win, a second and a third, respectively, in the Kyodo News Service Hai (G3, 1,800m; Feb.10), Saturnalia and Lance of Puraana, winners of the Hopeful Stakes (G1, 2,000m; Dec.28) and the Mainichi Hai (G3, 1,800m; Mar.23), respectively, and Satono Lux and Admire Justa, top two finishers of the Sumire Stakes (L, 2,200m; Feb.24). 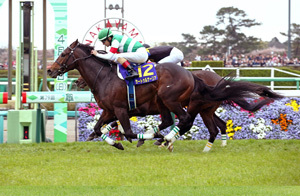 Al Ain (JPN, by Deep Impact) renewed the race record to 1:57.8 in 2017.